This website was created to showcase the MPAs of South Africa and to share the animals and ecosystems they protect and the benefits they provide to South Africans. The current focus is on the 20 new MPAs that were gazetted for public comment in February 2016 by the Minister of Environmental Affairs and approved by the South African cabinet in October 2018. Existing MPAs will be added to the website in 2019. Information and photographs were compiled by the South African National Biodiversity Institute (SANBI), the Oceans & Coasts Branch of the Department of Environmental Affairs (DEA) and through collaborative research conducted through the Department of Science and Technology (DST) and the National Research Foundation (NRF) funded projects with the African Coelacanth Ecosystem Program (ACEP). The design for the new MPA network is based on 12 years of marine biodiversity research and spatial planning in South Africa’s oceans. Most of the images on this website were captured by scientists using a Remotely Operated Vehicle (see Science), but there are many passionate ocean photographers who have contributed incredible imagery of South Africa’s ocean treasures. We’d particularly like to thank Peter Chadwick, Steve Benjamin and Geoff Spiby for their substantial contributions. Other contributors include Peter Timm, Laurent Ballesta, Lara Atkinson, Jock Currie, Ryan Daly, Simon Elwin, Zoleka Filander, Georgina Jones, Ryan Palmer, Astrid Blumer, Robin Leslie, Kerry Sink and Otto Whitehead. Thank you to all of you! Please keep sharing the beauty of South Africa’s oceans with the world. The Department of Science and Technology (DST) and the National Research Foundation (NRF) funded projects with the African Coelacanth Ecosystem Program (ACEP) that have enabled research in the new network of MPAs. Many scientists and technicians contributed to the development of the new MPA network, including those from the Department of Agriculture Forestry and Fisheries (DAFF), Department of Environmental Affairs (DEA), Ezemvelo KZN Wildlife, South African Association for Marine Biological Research (SAAMBR), South African Institute for Aquatic Biodiversity (SAIAB), South African Environmental Observation Network (SAEON), South African National Parks (SANParks), Nelson Mandela University (NMU), University of KwaZulu-Natal (UKZN), University of Cape Town (UCT) and Rhodes University (RU). The Phakisa Oceans Economy MPA initiative and its associated technical team played a central role. DEA members of the technical team include or have included Alan Boyd, Steve Kirkman, Mbulelo Dupolo and Matshidisho Malatjie. SANBI staff include Kerry Sink, Siyasanaga Miza and Tsamaelo Malebu. Contributors from Ezemvelo KZN wildlife and SANParks are noted below. This flagship programme of the Department of Science and Technology, which is managed through the South African Institute for Aquatic Biodiversity, facilitates marine research (focused on the east and south coast of South Africa) through funding, technical and logistical support, and promotes transformation in the marine science sector though active human capital development. Through an open competitive call, with themes aligned with South Africa’s priority research focusses, ACEP supports a number of multi-institutional, multi-disciplinary projects. Access to ACEP’s Marine Platforms, such as vessels, Remotely Operated Vehicle (ROV), and multi-beam sonar, has enabled cutting edge research which is feeding into ecosystem classification and mapping which in turn is important in Marine Spatial Planning and environmental decision making in the ocean. The SeaEye Falcon ROV is like an underwater drone with a camera in a housing to take video and photographs for scientific research. This equipment forms part of the ACEP Marine Platform. It is capable of diving to 300 m and is equipped with a high definition video and stills camera. This technology has allowed researchers to explore, conduct qualitative and quantitative visual research, observe behaviour and collect specimens from deeper than has ever been possible off small vessels in South Africa. The ROV has been particularly helpful in identifying ecologically important areas and classifying ecosystem types, both providing important information to spatial planners. The ACEP ROV has provided some of the first imagery in many of the new MPAs on the east coast. The ACEP Deep Secrets Project is led by Kerry Sink, SANBI’s Marine Program Manager but includes many Co-Investigators from across 13 institutes who collaborated to conduct visual surveys in 8 of the new MPAs during the 2016 Deep Secrets Cruise (Robben Island, Browns Bank Corals, Browns Bank Complex, Southwest Indian Seamounts, Agulhas Bank Complex, Agulhas Mud, Port Elizabeth Corals and Amathole Offshore). The project team mapped the “Kingklip Ridge” in Port Elizabeth Corals MPA, collected samples of deep water corals for taxonomic research and is working towards understanding the role as habitat for fishes such as kingklip and jacopever. Outside of the ridge, velocities of currents were recorded at 6 knots! The project collaborated with a petroleum company to obtain and analyse new bathymetric data canyon and slope ecosystems on the west coast, including Cape Canyon MPA. For further information visit SAEON and SAIAB. The ACEP Imida Frontiers Project is led by fisheries scientist Sven Kerwath (University of Cape Town) supported by Denham Parker and is undertaking fisheries, biodiversity and geological research. This project has collected abundance data for important linefish species, conducted benthic biodiversity surveys and mapped selected areas in Amathole Offshore MPA. The Imida Project undertook 100 ROV dives which Kerry Sink from SANBI used to support both ecosystem classification and mapping, aiding the delineation of Amathole Offshore MPA. The shelf, shelf edge, slope and canyons have been surveyed through this project, as well as the Kei river fluvial fan and nearshore reef habitat. South Africa’s sponge taxonomist Toufiek Samaai (DEA) is leading taxonomic work on this important group of animals. Biodiversity surveys in the offshore expansion area of Aliwal Shoal MPA were made through the ACEP Surrogacy Project. Dr Jean Harris (then at Ezemvelo KZN Wildife) was the Principle Investigator of this project that conducted 35 ROV surveys between Stanger and Port Edward. The team also facilitated new surveys at Protea Banks as part of a joint Protea Canyons Survey which was also supported by a NRF - funded project to study deep reefs, the shelf edge and canyons in Pondoland and southern KZN (Principle Investigator Kerry Sink). This joint work helped to map and survey offshore biodiversity on the deep reefs and canyons in Protea Banks MPA. 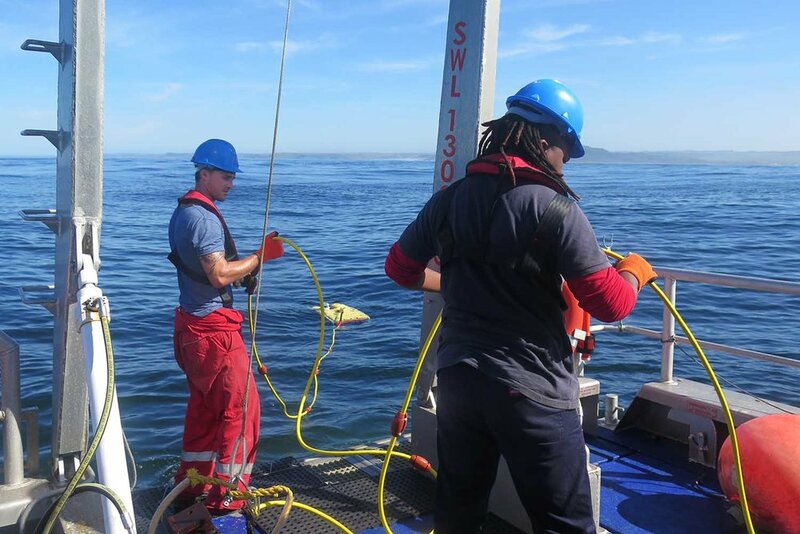 The ACEP Spatial Solutions Project undertook 61 ROV dives on the mid, outer shelf and shelf edge between Richards Bay and Scottburgh covering the 30-284 m depth range. The project collected visual imagery for sandy, gravel, deep reef and muddy ecosystem types. Biodiversity surveys were planned by Dr Jean Harris (Ezemvelo KZN Wildlife) to build on the Surrogacy project providing a systematic sampling grid to support spatial planning and MPA expansion in KwaZulu-Natal. The Principle Investigator of this project is Professor Andrew Green (UKZN) who has also supported submarine canyon mapping for the National Ecosystem Map. The new ACEP Canyon Connections Project is led by Prof Mandy Lombard at Nelson Mandela University and is advancing knowledge about submarine canyons in South Africa. The 2018 expedition took place in iSimanagaliso Wetland Park and provided imagery of Jesser and Diepgat Canyons and their spectacular biodiversity. Prof Rosemary Dorrington of Rhodes University leads this project that has conducted foundational biodiversity surveys in Addo Elephant National Park MPA. This project has effectively sampled sponges using a claw on a metal arm operated by the ROV and is doing research on biodiscovery with a focus on sponges and microbial diversity. The project provided imagery for Riy Banks, the deep reefs off Bird Islands and the lace coral gardens at Evans Peak. The new ACEP Deep Forests project is led by Kerry Sink and builds on previous work near East London and will conduct new mapping and ROV surveys in the Cape St Francis area. Further work in Amathole Offshore MPA is planned to improve taxonomy of habitat forming animals and help map and manage Vulnerable Marine Ecosystems such as sponge grounds, coral gardens, seapen fields and other fragile ecosystem types that benefit from spatial management. The research survey by ROV was undertaken by ACEP in 2005 using a hired ROV, building on previous surveys by submersible (2002-2004). ACEP acquired a dedicated research ROV in 2008/9 and undertook a survey in Jesser Canyon in 2011. A joint coelacanth expedition in 2013 undertook 21 ROV dives in the iSimangaliso Wetland Park, and the first coelacanth survey by ROV in 2005. Since trimix divers first discovered Sodwana’s coelacanths in 2000, SANBI scientist Kerry Sink has documented at least 30 individual coelacanths in this MPA with divers discovering half of the individuals in the catalogue. ACEP coelacanth expeditions have surveyed many canyons between Island Rock in the north and Cape Vidal in the south including Mabibi, White Sands, Wright, Jesser, Diepgat, Leven, Leadsman and Chaka Canyons. The SAEON deep water camera system is known as the ski-monkey and consists of a camera in a deep water housing on skis allowing a ship to tow this camera along the seabed. This camera is a key tool being used in a collaborative project to study the potential of the seabed to recover from the potential impacts of trawling. This project is led by SAEON scientist Dr Lara Atkinson but also includes collaborators from the UCT, SANBI, DAFF and the South African DeepSea Trawl Industry Association. The team surveyed the outer shelf and shelf edge near Childs Bank that resulted in the first visuals of the seafloor in Childs Bank and Benguela Mud MPAs. Other SAEON projects contributing to MPA research in South Africa include those sampling shallow and deep reefs by ROV and Baited Remote Underwater Video (BRUV). A collaborative survey of reef pinnacles including the Alphard Banks conducted one of the early research surveys by ROV. This programme is led by DEA benthic ecologist Zoleka Filander and includes a team of young scientists and technicians who work with a towed camera in a housing to survey the seabed. The programme includes the Cape Canyon project for which Zoleka is the Principle Investigator and seabed surveys to understand ecosystem types in the southern Benguela. Zoleka is a Co-investigator on the Integrated Ecosystem Programme, leading the benthic component. This includes four long term monitoring lines off Scarborough, St Helena, Namaqua and Kleinsee. Zoleka is undertaking a PhD in coral taxonomy focused on deep water taxa and the family Dendrophyllidae and is contributing to the ACEP Deep Secrets Project. The DEA Benthic Ecology Programme has provided knowledge, video and photographs for the following MPAs: Orange Shelf Edge, Namaqua National Park, Robben Island and Cape Canyon. Knowledge and imagery of bays, canyons, shelf edges, and sandy, rocky and muddy shelf ecosystems were provided by this team. Ezemvelo KZN Wildlife leads MPA expansion planning in the Province of KwaZulu-Natal in close collaboration with National efforts. EKZNW led the ACEP Surrogacy project which started in 2014 and is part of the ACEP Spatial Solutions Project focused on the collection of data to better understand offshore habitats and ecosystems to better inform conservation planning in the Province. These projects helped test and further understanding of biophysical biozones developed by Tamsyn Livingstone and incorporated into the KZN Marine Conservation Plan. They are advancing the understanding of species assemblages and fish communities through the collection of data using Baited Remoted Underwater Videos (BRUVs) and plankton studies; and the understanding of habitats through the collection of data using the Remotely Operated Vehicle (ROV). Ezemvelo is also involved in the multi-institutional ACEP Canyon Connections project which is helping understand the role and functioning of canyons offshore of KwaZulu-Natal in the Delagoa and Natal Bioregions. All these projects have made significant contributions to the Phakisa MPA network. Ezemvelo staff Tamsyn Livingstone and Joe Phadima are members of the technical team for the Operation Phakisa MPA Initiative. Tamsyn Livingstone has provided GIS and spatial analyses to support to the team, coordinated stakeholder engagement in KZN and provided scientific support for the design of MPAs in KZN. Joe Phadima has provided both socioecological input and scientific experience to the team and guidance throughout the MPA process. His areas of contribution were mainly in terms of examining economic benefits and the contribution of MPAs to job creation, improved livelihoods and social cohesion. The Oceanographic Research Institute (ORI) is the research division of the South African Association for Marine Biological Research (SAAMBR), a non-government, non-profit company formed in 1951. With a long history of involvement in research leading to the proclamation of MPAs in KZN, ORI scientists have been also involved in research that has contributed to the selection of the network of 22 new or extended MPAs. Based on their research and experience, ORI scientists made substantial contributions to the Operation Phakisa Lab in Durban in 2014. Most of ORI’s attention has been focused on the four MPAs planned for KZN namely an offshore and southern extension of the iSimangaliso Wetland Park, establishment of a new MPA off uThukela, an offshore and northern extension of the Aliwal Shoal MPA and establishment of a new MPA on the Protea Banks. While ORI staff have contributed much data and expertise on the marine spatial assessments and plans such as the National Biodiversity Assessment and Ezemvelo’s SeaPLAN that were used to design the network of MPAs over the past 10 years, our recent involvement has focused primarily on numerous stakeholder engagements as members of the provincial technical team and public participation forums set up by Ezemvelo as part of Operation Phakisa. ORI staff participated in the ACEP Surrogacy and Spatial Solutions Projects and led the ACEP uThukela Bight Project providing foundational science on the functioning of the KwaZulu-Natal Bight. SAAMBR has also provided marine social science and substantial science communication support. South African National Parks leads MPA expansion planning in areas adjoining coastal National Parks such as Addo Elephant and Namaqua National Park in close collaboration with National efforts. SANParks developed a finescale systematic conservation plan for the Addo Elephant National Park MPA. This included research on commercial, recreational and small scale fisheries use patterns and distribution in Algoa Bay, distribution of linefish and abalone stocks, and reef diversity. This research was supported by SEAON, SAIAB and Rhodes University and led by Dr Russell Chalmers and Dr A Oosthuizen. Intensive stakeholder consultations took place over 10 years to incorporate stakeholder needs, use and views of Addo Elephant National Park MPA. Dr Ané Oosthuizen is a member of the technical team for the Operation Phakisa MPA Initiative. Ecologically or Biologically Significant Marine Areas (EBSAs) are internationally recognised special places in the ocean. They can be pristine, unique, vulnerable, productive and/or diverse areas, important for supporting key life-history stages or threatened species and habitats. South Africa currently has 18 EBSAs that are recognised by the Convention on Biological Diversity (CBD), 8 of which extend beyond our national jurisdiction into other countries or the high seas. EBSAs in South Africa, Namibia and Angola are currently being revised and updated with new information as part of a GIZ-funded project: Marine Spatial Management and Governance (MARISMA) of the Benguela Current Large Marine Ecosystem. DEA, with support from Nelson Mandela University and SANBI and other interested parties, have identified and described another four new South African EBSAs that will be proposed to CBD, largely based on the research and new discoveries from a lot of the other projects on this page. Many of the new MPAs are within recognised EBSAs. Find out more on the EBSA website. The Marine Geology Programme at UKZN has helped advance ecosystem classification and mapping and provided important knowledge and seafloor imagery to support Marine Protected Area design. The programme is led by Andrew Green who is also the Principle Investigator of the ACEP Spatial Solutions Project and the Geology lead for the ACEP Deep Secrets and Imida Projects. This team of geologists and students have contributed to Cape Canyon, Protea Banks, uThukela Banks, Aliwal Shoal Offshore, Amathole Offshore and Port Elizabeth Corals MPAs. New maps for the Protea Canyons, deep reefs on the uThukela Banks, Cape Canyon and the spectacular Gxulu Canyon off East London have been produced. The team also provided information and images for shelf edge, canyon, reef and bank, plateau and slope ecosystems.